The steakhouse, that long-standing bastion of conservatism, is evolving. Diners have become more knowledgeable about supply-side details like sourcing and heritage breeds, while chefs have enthusiastically embraced a more adventurous and international perspective. Top-shelf identifiers like USDA grading have been prodded aside to make room for name-dropped provenance like Wagyu. And local purveyors like Two Run Farm supply some of the city’s best restaurants. The result: the steakhouse is no longer a pigeonhole but rather a canvas. So in this piece let us hold, as ’twere, a mirror up to cattle and show beef its own virtue, char its own form and the very age and populous of New Orleans through a couple of the restaurants who best serve ’em up on a plate. In short, here is steak three ways. What could be more romantic than Argentina? An Argentine steakhouse. Well, it’s more convenient, anyway. La Boca, that long-standing villa of smoldering beef, is a destination for those who want something other than a choice of strip or filet. You want yours with béarnaise? Too bad, because here you’ll get a trio of chimichurris. And with its atmospheric dining room overlooking St. Joseph and Tchoupitoulas streets smack in the heart of the Warehouse District, you’ve got some instant cred. It says you’re a cut above the pack and, if you play your cards right, the most Interesting Man in the World. So what makes La Boca different? “First and foremost it’s Argentine-inspired,” says chef Jared Ralls. “We also serve as many different cuts as possible. Instead of having three or four choices like you’d have at a regular steakhouse, here you have 12 or more.” As ingredients are minimal, Ralls’ sourcing and cooking techniques are top priority. Cuts hail from purveyors such as Imperial Wagyu out of Nebraska and Oregon’s Painted Hills Ranch, to name two. Technique-wise it’s all about grillwork. Ralls gets cuts that are meant to be grilled, not roasted or braised. I like the Vacio, fanned out on the plate and paired with a towering cone of thin, garlicy fries. The trio of complimentary sauces cuts against the grain of what you’d typically find in a steakhouse. Rather than egg yolk-enriched emulsions or cloying demi-glace here is brightness, herbs and acidity that counterbalance the primacy of the meat. The herbaceous green chimichurri is the most traditionally Argentine sauce, but my favorite is the white sauce spiked with horseradish, to my mind a woefully underutilized accompaniment for steak. One of Ralls’ go-to choices is the Hanger Steak, sourced from Painted Hills and notable for its texture and minerality. Pair it with a big, full-bodied Malbec from the exclusively Argentine wine list and you’re in carnivorous bliss. Few places are a better fit for the business crowd than Mr. John’s Steakhouse, located in the Avenue Plaza Resort in the Garden District. Guests are ushered through the clubby reception area into the main dining room with its checkered tile floor and wood paneling, with windows overlooking the corner of Josephine Street and St. Charles Avenue. It isn’t glitzy but it is timeless, and customer service is entwined in its DNA, given Managing Partner Desi Vega’s experience at Commander’s Palace and Ruth’s Chris. The menu will seem familiar enough, with a traditional roster of filet, strip and rib-eye. The steaks are broiled and served sizzling in butter, seasoned with just salt, pepper and a garnish of chopped parsley. The beef doesn’t need much else, but you can dress yours up with sauces, such as bordelaise, available à la carte. Consider the rib-eye with its excellent marbling and, while tenderloin has its detractors amongst the meat snob set, the filet served here is tender and flavorful. It also pairs best with the sauces. What really helps Mr. John’s stand out are the sides, which would do Thanksgiving proud, particularly the sugary sweet potato mash soufflé. Potatoes au gratin and creamed spinach ensure you’ll reach caloric overload by the time the check arrives. A well-curated wine list seals the deal with prices across all points. Just don’t wear white – the steak arrives at the table sizzling. Relative newcomer Primitivo, the wood-fired gathering place on Oretha Castle Haley Boulevard, isn’t strictly a steakhouse per se, but its hearth-centric concept and meat-forward menu should make it part of any serious steak discussion. Of particular interest is the coal-grilled 26-ounce prime rib-eye, which may be one of the finest steak dishes in the city. The plate – or more accurately, the platter – for this behemoth shared entrée showcases garnet red slices banded by ridiculously delicious char fanned out and topped with a split bone glistening with marrow. The jus melds with the accompaniments on the plate – recently mushrooms and green beans, though these change based on availability – which are also smoked in one of the many iron boxes embedded in the custom beast of a grill that dominates the open kitchen. Wood fire and smoke permeates most every dish at Primitivo, and the flavors lean toward the big, bold and rustic. Here is steak at its most elemental, and the family-style emphasis adds to the appeal. 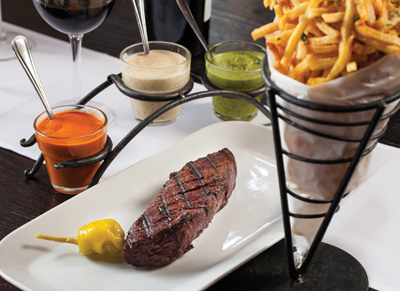 If you’re looking for a steakhouse with a little something for everyone, consider Dickie Brennan’s Steakhouse in the French Quarter (716 Iberville St., 522-2467, DickieBrennansSteakhouse.com). Its Creole mashup menu serves steaks and a whole lot more with plenty of local topspin – think spicy seasoning, optional extras like jumbo shrimp and sauces like Irish Whisky Pepper Cream. Still, the fundamentals are there for the purists, as well as prime rib served with horseradish crème sauce. 1800 Oretha Castle Haley Blvd.